President Muhammadu Buhari (left) with the British Prime Minister, Theresa May, at 10 Downing Street, London yesterday. President Muhammadu Buhari yesterday said that he is more concerned with tackling the myriad of security and economic challenges ‎in Nigeria than preoccupy himself with the forthcoming 2019 election. 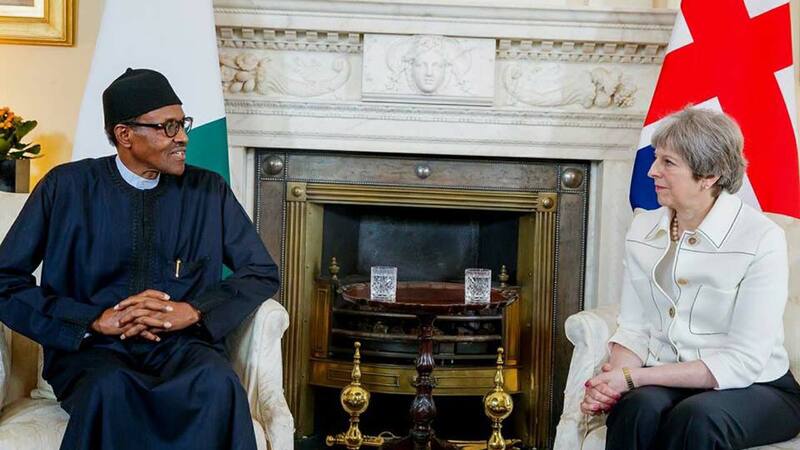 President Buhari’s position resonated as he held bilateral talks on his administration’s three-pronged focus with British Prime Minister, Theresa May at 10, Downing Street, London. “We campaigned on three major issues, to secure the country, revive the economy and fight corruption,” said the President.“We have elections next year, politicians are already pre-occupied with the polls, but I am bothered more about security and the economy,” he stressed. President Buhari, in a statement signed by his Special Adviser on Media and Publicity, Femi Adesina, yesterday commended British companies like Unilever, Cadbury, and many others, “who have stood with Nigeria through thick and thin. Even when we fought a Civil War, they never left. Prime Minister May, in her remarks, said Britain would continue to work with Nigeria in the areas of training and equipping the military. She was particular about abduction of young schoolgirls by Boko Haram, noting that Britain would continue to give Nigeria needed assistance. Prime Minister May, who commended President Buhari for the much he has been doing on improving trade and business for Nigeria, noted that it was also time to boost intra-Commonwealth trade.